Well groomed eyebrows is an important contribution to your overall appearance and beauty especially if they are perched up on their proper position. Most gals out there spend a fortune keeping their pairs trimmed and well shaped all the time, but once they start to droop down, there seems to be no amount of grooming and make up that can make them as stunning as before. Botox had been handy in keeping the position of our brows intact, especially when done by a cosmetic, plastic surgeon like Prof. Somyos Kunacha who had been in this field for more than 30 years in Thailand, however, there is a limit as to the powers of our magic injection. During the earlier stages of drooping where not much excess skin is present on the upper eyelid, botox can work its wonders, but once the excess skin on the upper eyelid becomes too heavy and it starts to really pull the brows down, surgery may be your only option. HOW IS BROW LIFT in Thailand DONE? At Yoskarn Clinic, our surgeons offer three (3) approaches for Brow Lift, the Direct Browlift, the Endoscopic Brow Lift, and the Forehead Lift. DIRECT BROW LIFT is the more traditional eye brow correction technique in Thailand that works best only for certain cases such as lateral drooping of the eyebrows. 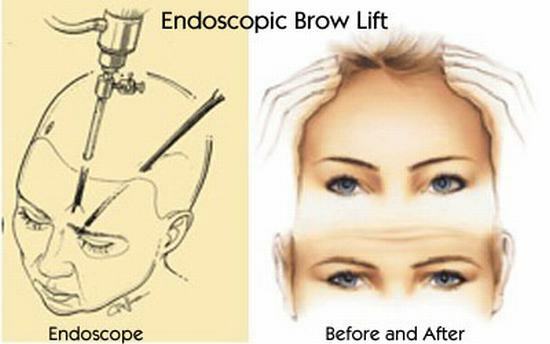 This surgery involves an incision just above your eyebrows to pull the brows up depending on the need of the patient. Though direct browlift is the simplest and the most budget friendly technique, it is not recommended for everyone especially for patients who are prone to keloid scarring. ENDOSCOPIC BROW LIFT in Thailand is the more modern and innovative approach which makes use of an endoscope to lift the skin and view the underlying structures on the forehead and surrounding area. With the endoscopic technique, more areas may be covered and corrected. The incision site (3-5 small holes) will be placed behind the hairline so scarring will not be a problem. More often now, endoscopic brow lift is the technique of choice due to its minimal invasive nature, however, this approach is also more pricey than the direct eye brow correction. 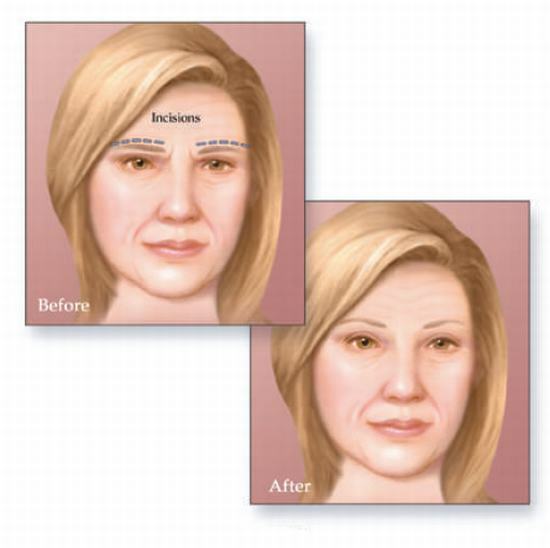 FOREHEAD LIFT in Thailand can be done either with coronal incision or an incision in front of the hairline. 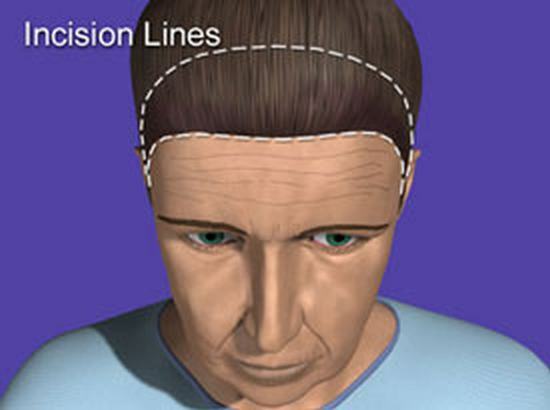 In this technique, the scalp and forehead skin along with the eye brows is repositioned to its more youthful place and the excess skin is excised. The procedure us usually just recommended for those who are also concerned with the foreheard area. Though this procedure is more invasive than the other two, the result is usually more precise. Another advantage of the foreheadlift and the endoscopic brow lift is that both also address forehead lines, crow’s feet, and drooping of the upper eyelids though the endoscopic lift will not involve excision of skin. If you are one of those who are bothered by the sagging and low position of your eyebrows and you feel like you always look tired, then browlift in Thailand may just be the answer you are looking for. If your forehead lines no longer respond to botox along with your frown lines, you may also start to consider a trip to Bangkok for a quick brow lift surgery. WHAT RESULT CAN YOU EXPECT AFTER YOUR BROW LIFT SURGERY in Thailand? The natural position of the eyebrows in our youth is on top of the prominent brow bone hence, our surgeon should not lift it beyond that. So many brow lift disasters had been present in Hollywood so it will be best to seek out the help of an experienced surgeon like Prof. Somyos Kunachak. After a successful brow lift in Thailand, you will see that your eyes look brighter and that you may be able to convey more expressions with your face. WHAT ARE THE RISKS ASSOCIATED WITH BROWLIFT SURGERY in Thailand? Visible scarring is a possibility with direct brow lift though our surgeon will do his best to make the mark as inconspicuous as possible. A surgeon without proper experience with Eye Brow Lift in Thailand may pull the brows too high making the result unnatural and unpleasant so your choice of surgeon matters a lot. Other theoretical risks can be minimized with proper post-operative care from our staffs. We also offers a whole package of accommodation from our nearby hotel, Aphrodite Inn, which sits adjacent to our facility with a connecting door on the 2nd floor for patient privacy. The 2nd floor of Aprodite Inn was also converted to suit the needs of our patients, pre and post-operatively. Each room is equipped with mechanical beds, with hotel quality mattresses, and oxygen outlet for patients who just had surgery. Medical equipments and emergency apparatuses are also within reach from the rooms so there will be no need to worry about recovery.